The real risks of the shale gas revolution, and how to manage them. The resulting boom is transforming America’s energy landscape. As recently as 2000, shale gas was 1% of America’s gas supplies; today it is 25%. Prior to the shale breakthrough, U.S. natural gas reserves were in decline, prices exceeded $15 per million British thermal units, and investors were building ports to import liquid natural gas. Today, proven reserves are the highest since 1971, prices have fallen close to $4 and ports are being retrofitted for LNG exports. The shale boom is also reviving economically suffering parts of the country, while offering a new incentive for manufacturers to stay in the U.S. Pennsylvania’s Department of Labor and Industry estimates fracking in the Marcellus shale formation, which stretches from upstate New York through West Virginia, has created 72,000 jobs in the Keystone State between the fourth quarter of 2009 and the first quarter of 2011. The Bakken formation, along the Montana-North Dakota border, is thought to hold four billion barrels of oil (the biggest proven estimate outside Alaska), and the drilling boom helps explain North Dakota’s unemployment rate of 3.2%, the nation’s lowest. 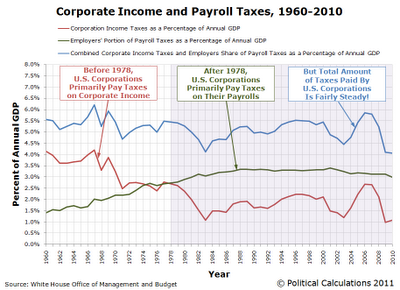 What are the unintended consequences of taxing U.S. businesses so much more on their payrolls than their corporate incomes? 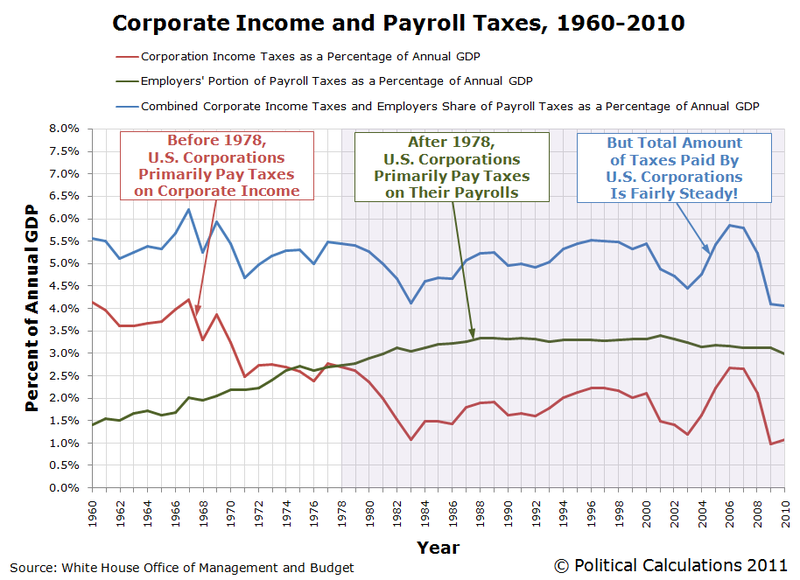 This isn’t necessarily an intellectual exercise – this is something that has been the case since 1978, when the amount of taxes paid by U.S. businesses first began regularly exceeding the amount of taxes they collectively paid on their business incomes. 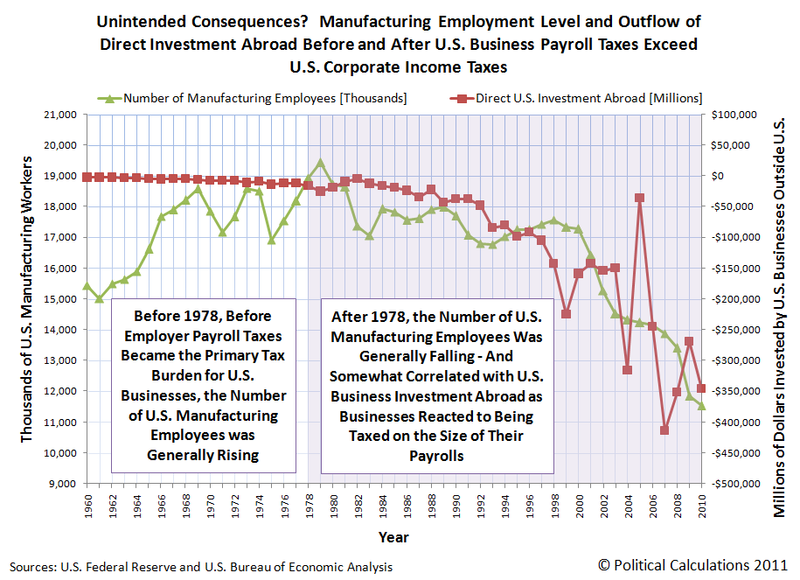 Yesterday, we hypothesized that U.S. businesses would respond by shifting jobs outside of the United States, since that would be the most likely way they could preserve their revenues while avoiding the employers’ portion of U.S. payroll taxes. Today, we’ll go a step further – we’ll hypothesize that the jobs that would most likely be displaced in this way would most likely be in manufacturing. The reason why is because manufacturing is something that isn’t necessarily location specific, as most service type occupations are. For example, it doesn’t really matter much where your mobile phone is manufactured – it could be in Europe, or Asia, here in America or in Africa for that matter – no matter where it might have been produced, it will still be the same mobile phone. By contrast, the service occupations that support your mobile phone will be location specific. You can likely easily find local outlets for your service provider, which must be fairly close to where the customers for mobile phone service are. For every $100 of consumer spending today, only $13.50 is spent on food, clothing and household furnishings and $87.50 is spent on everything else. Contrast that to 1948, when it took $40 of every $100 of spending for the basics, leaving only $60 to spend on all other goods and services. 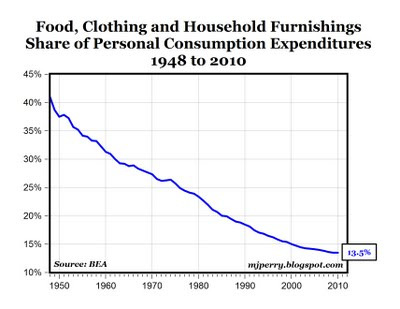 Bottom Line: Without the major productivity gains in the manufacturing sector over the last fifty years, it would still require almost half of consumer spending just to furnish our houses, and feed and clothe our families. The standard of living for the average American household has improved significantly over the last 50 years, and keeps getting better all the time, thanks in large part to greater manufacturing productivity. Here’s the proof that productivity gains have improved our lives: Would you be willing to exchange your computer and laser printer for an old manual typewriter? Would you be willing to exchange your cell phone or iPhone for an old rotary phone? Would you be willing to exchange your big-screen color TV for an old black and white TV? Would you be willing to trade your iPod and iTunes for an old phonograph and 45 RPM records? Would you be willing to trade your modern refrigerator, washing machine or dishwasher for appliances from the 1950s? Decision-makers have responded as if they were facing liquidity crises (we don’t have enough cash to pay off debts immediately) instead of solvency crises (we will never be able to pay off these debts). Too often pain has not been prevented, but just postponed — and prolonged. In retrospect, much of the pain could not be avoided. As economist Tyler Cowen has put it, we were not as rich as we thought we were. Housing bubble prices did not turn out to be real wealth, unless you sold out at the peak and moved to a cave. Trying to put everyone back in the position they once thought they were in simply won’t work. But it does sound attractive politically. People can remember what life was like in the past. At market prices, without public subsidies, a unit of energy produced by solar or wind in the US costs five times more than a unit produced by oil, gas, or nuclear plants. Moreover, supporters of alternative energies systematically downplay their negative environmental impact. A wind turbine requires 50 tons of steel and half a square mile of ground space. If California were to rely on solar power for its electricity consumption, the entire state would have to be covered with photovoltaic cells. The great irony of the current situation is that real innovation and entrepreneurial activity, without government support, is taking place in the field of energy generation, such as in the creation of miniaturized nuclear reactors. The most promising breakthrough may well be the discovery of huge reserves of shale gas all over the planet. Indeed, thanks to the new techniques in hydraulic fracturing and horizontal drilling, shale gas may well become the dominant energy resource of the future. Shale gas could thus reduce dependency on OPEC oil and gas while reducing carbon emission. Gas generates ten times less carbon than biomass or ethanol, which ecologists so heavily promote. 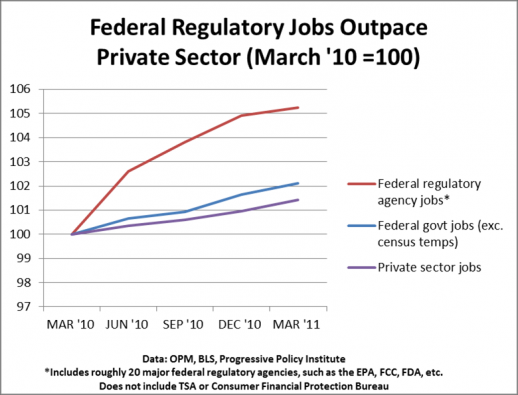 What Is a Real Economic Recovery? The housing bubble itself is a microcosm of the larger economy that was built on fiat money and constantly leveraging credit production. Incomes were at best stagnant during that period, but asset prices kept rising and the economy kept growing. As is well known, both were predicated solely on the creation of credit. Without new money to fill the income gap, it all fell apart. Economic activity based on the price of assets is a disaster waiting to happen, a massive ponzi scheme. In the aftermath of that disaster, it is certainly tempting to try to rebuild exactly as before – it seems like the path of least resistance. There is also a tendency to view the economy just before the collapse as the standard for economic potential and a target for the recovery. Policymakers are intent on getting the economy back to where it was in 2006 and 2007 because they mistakenly believe that economic potential is some historical data series. It is a fool’s errand. The economy of the pre-crisis period had gotten too far ahead of sustainability because of improper price signals and misaligned credit creation. Maintaining improper price signals and misaligned credit creation hardly seems to make sense now (two economic wrongs don’t make a recovery). This financial miscalculation, fostered by the maintenance of artificial interest rates, bleeds beyond financial investments into business operations. The focus on liquidity makes profitable businesses ignore economically helpful projects. These kinds of expansions are, by their nature, risky and illiquid. Instead, cash is preferred. So are financial maneuvers – stock buybacks over factory expansion or a new research focus; paying a premium for a smaller competitor rather than acquiring a new unproven technology that might take longer to develop. Above all else, immediate returns are demanded at the expense of long-term investment. As long as liquidity is the primary consideration, profitability is itself a trap. Rather than fostering the sustainable flow of money within an economic system, unilateral profitability is a dead end. Money flows to the bottom line of companies and stays there. Without a real, non-financial outlet for accumulated net income we are all poorer for it. The opportunity cost of dead-end profitability is lost wealth. In the end, wealth-creating activities create a recovery, not financial trading. The vertical lines mark the two big Fed announcements. On Aug. 10, the central bank announced that it would reinvest maturing assets in Treasuries. On Nov. 3, it announced the actual QE2 program. QE2 doesn’t seem to have lowered any interest rates. With near-zero short-term interest rates, and bank reserves paying interest, money is exactly the same thing as short-term government debt. A bank doesn’t care whether it owns reserves or three-month Treasury bills that currently pay less than 0.1 percent. 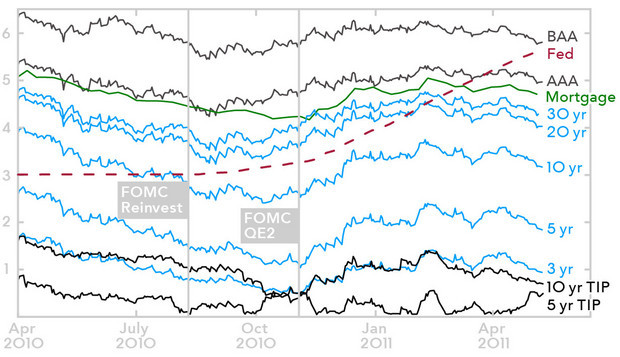 This is what drove the Fed to QE2 in the first place. Conventional easing — buying short-term Treasuries in exchange for reserves -– obviously has no effect now. Taking away your green M&Ms and giving you red M&Ms instead won’t help your diet. But if exchanging money for short-term debt has no effect, it follows inescapably that giving banks more money is exactly the same as giving them short-term debt. All QE2 does is to slightly restructure the maturity of U.S. government debt in private hands. Public universities receive more for educating than they spend to educate…. Where’s All the Money Going? Table 1 below displays some of our most relevant findings. It shows “Total Educational Payments” (the equivalent of total tuition revenues, including financial aid, plus state/local appropriations) and “Education and Related Spending” (the sum of instructional and student services expenses plus an attributable portion of related indirect support costs) across different sectors of higher education. Subtracting Total Educational Payments from Education and Related Spending yields the average amount that colleges subsidize their students (shown in the table’s last column). Negative numbers mean that the colleges receive more in revenues to educate students than they actually spend to educate them. The prevalence of negative numbers in the table above means that it is not generally the case that colleges subsidize their students—in fact, colleges are generally the ones receiving a subsidy. richer people spend extra money on themselves and as US gets richer, healthcare costs go up…. NRO’s domestic-policy blog, by Reihan Salam.